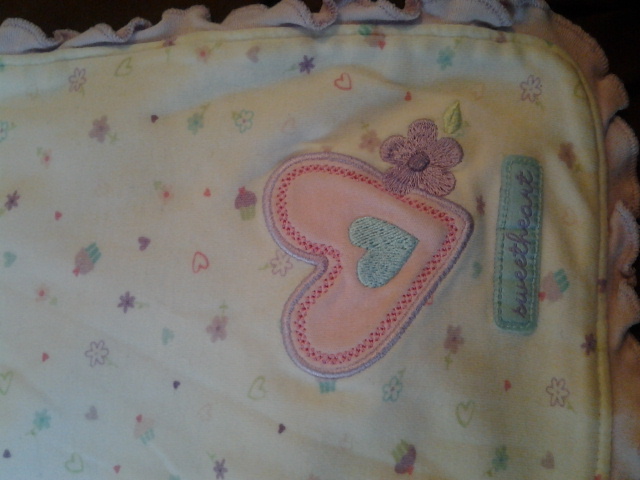 I’m sure most moms have that one item from their child’s baby days that they just can’t part with.I’ve seen these things vary among my mom friends: a pacifier,a shoe, a lock of hair,etc.Well for me,its a baby blanket. I remember getting the blanket as a babu shower gift although I don’t remember who gave it to me.After Bubba was born I used it as soon as I bought her home from the hospital.I’ve used it to keep her warm in her crib,to wrap her up in after a bath.It’s been peed,pooped,and thrown up on.I’ve let her wrap her baby dolls up in it and walk around the house with. Recently, I threw out the majority of Bubba’s too small clothes and I ran across the blanket.I couldn’t believe I still had it after all these years and I didn’t need it,so I tossed it in the garbage pile. Then I remembered when Bubba got her first cold at two months old. She was so fussy and miserable and I was overcome with guilt.How can I have let her catch a cold?Who does that? 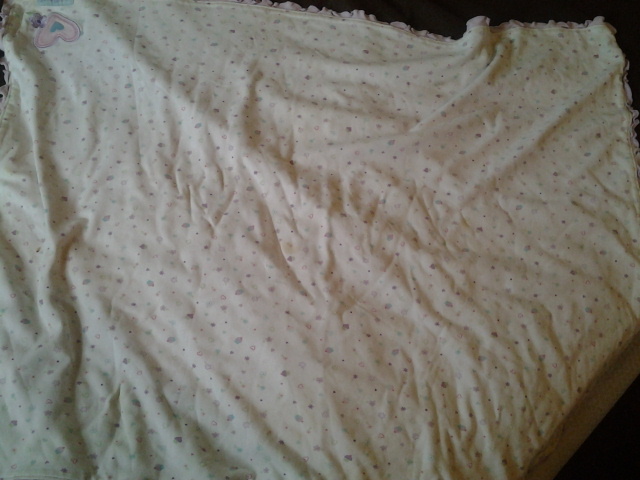 Anyway, her nose was running and she looked so pitiful,I took a corner of the blanket and swiped at her nose with it. While thinking about that I came to the conclusion that I did need the blanket.I needed it for when she’s 16 and decides I’m not cool anymore and I need a reminder of the little girl who couldn’t get enough of me. I’ll need it when she moves out and I need to look at something that is proof that she was there.I’ll need it when she has her own daughter and I hold my granddaughter for the first time. THANK YOU TO MRS SHUGAR(SHUGAR LOVE AND HER ALL YOU NEED IS LOVE PROJECT FOR THIS LOVELY BLOG HOP! This is a post inspired by today’sDaily Prompt. Hope you’ll be listening to your favorite songs while reading this! My playlist is filled with songs that bring up both good and bad memories or evoke strong emotions that I’m currently dealing with or have dealt with. I think its important to listen to the songs that bring bad memories so I’m reminded of where I’ve used to be and where I am now.Here are four of the songs that are constantly on repeat and why. 1)Don’t You (Forget About Me) by Simple Minds- Everyone knows this song as the theme song to the movie The Breakfast Club.However,I automatically am reminded of my ex boyfriend. Remember the scene where Molly Ringwald put her diamond earring in Judd Nelson’s hand? Well, my ex did the same thing with his earring while we were watching that scene.It was the sweetest thing he’d ever done for me. Unfortunately, like the relationship, the earring is aslo lost.I lost it before we broke up,so maybe that was a sign. 2)For The Good Times by Al Green- In my opinion,Al Green was an expert at making a song that just made you want to rip your heart out and give it to your ex. For me,I think about two events in my life:the last time my family spent the day together at Coney Island and accepting my mother’s death. Fave Lyric: “Don’t look so sad, I know its over.But life goes on and this world keeps on turning.Let’s just be glad we had this time to spend together”. 3)Got To Be There by Michael Jackson- Any true MJ fan had that ONE song that defines that one person or situation in their lives.Every time I hear this song,I think of Bubba.When I had to leave her to work,she would sometimes cry for me to stay home and I wanted to.I had to remind myself that I was working to provide for her.At the same time, I didn’t want to miss any part of her growing up.It was a “damned if I do,damned if I don’t” situation. WHAT ARE SOME OF YOUR FAVORITE SONGS?WHY?